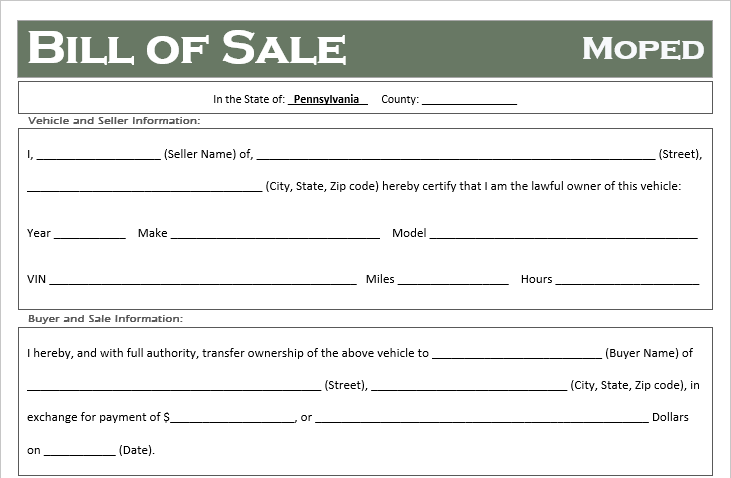 When buying or selling a Moped in Pennsylvania you always want to document the transfer of vehicle ownership from the seller to the buyer. Typically this is done by signing the “Transfer by Owner” or “Assignment” section on the rear of the original title. We also suggest securing a Pennsylvania bill of sale to properly document the sale including the sales price, condition of the vehicle, and hold harmless language to protect the buyer and seller. 1. Mopeds can range in price from hundreds to thousands of dollars. Whether you giving or receiving cash for an item, you want proof of the transaction in the event someone claims your ownership (if you are the buyer) or if someone is injured by the vehicle (if you are the seller). It is the simplest form of insurance. 2. Some states require you register a Moped with the department of motor vehicles (usually when the engine size is larger than 49cc). Proper documentation of ownership is needed in order to register your Moped. In short, a properly executed Bill of Sale will protect you from future liabilities during use of the moped and allow you to register the vehicle (if required). After you have made a purchase and received an executed bill of sale the first thing you should do is put it in a secured location. If lost, you won’t be able to apply for registration, won’t be able to prove ownership if someone claims the vehicle is theirs, and you may have some difficulty selling the moped. We always suggest locking up your bill of sale in a filing cabinet or safe, where a combination or key is needed to access.